This circuit is used to automate the working of a bathroom light. It is designed for a bathroom fitted with an automatic door-closer, where the manual verification of light status is difficult. The circuit also indicates whether the bathroom is occupied or not. 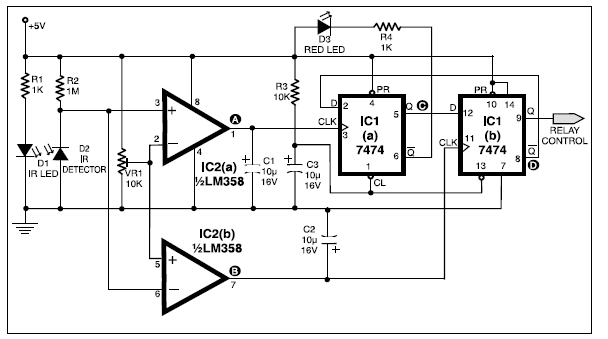 The circuit uses only two ICs and can be operated from a 5V supply. As it does not use any mechanical contacts it gives a reliable performance. One infrared LED (D1) and one infrared detector diode (D2) form the sensor part of the circuit. Both the infrared LED and the detector diode are fitted on the frame of the door with a small separation between them as shown in Fig. 1. The radiation from IR LED is blocked by a small opaque strip (fitted on the door) when the door is closed. Detector diode D2 has a resistance in the range of meg-ohms when it is not activated by IR rays. When the door is opened, the strip moves along with it. 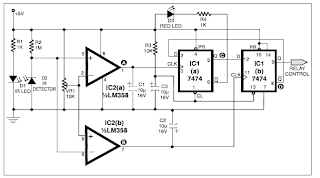 Radiation from the IR LED turns on the IR detector diode and the voltage across it drops to a low level. 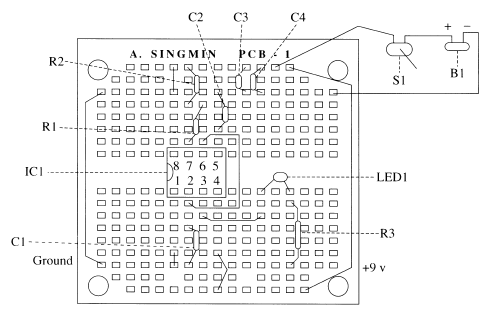 C o m p a r a t o r LM358 IC2(a) compares the voltage across the photo detector against a reference potential set by preset VR1. The preset is so adjusted as to provide an optimum threshold voltage so that output of IC2(a) is high when the door is closed and low when the door is open. Capacitor C1 is connected at the output to filter out unwanted transitions in output voltage generated at the time of opening or closing of the door. Thus, at point A, a low-to-high going voltage transition is available for every closing of the door after opening it. The second comparator IC2(b) does the reverse of IC2(a), as the input terminals are reversed. At point B, a low level is available when the door is closed and it switches to a high level when the door is opened. Thus, a low to- high going voltage transition is available at point B for every opening of the door, from the closed position. 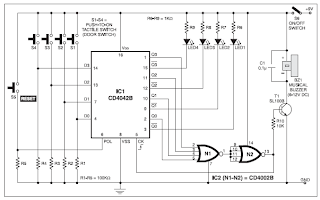 Capacitor C2 is connected at the output to filter out unwanted transitions in the output voltage generated at the time of closing or opening of the door. IC 7474, a rising-edge-sensitive dual-D flip-flop, is used in the circuit to memorise the occupancy status of the bathroom. IC1(a) memorises the state of the door and acts as an occupancy indicator while IC2(b) is used to control the relay to turn on and turn off the bathroom light. Q output pin 8 of IC1(b) is tied to D input pin 2 of IC1(a) whereas Q output pin 5 of IC1(a) is tied to D input pin 12 of IC1(b). At the time of switching on power for the first time, the resistor-capacitor combination R3-C3 clears the two flip-flops. As a result Q outputs of both IC1(a) and IC1(b) are low, and the low level at the output of IC1(b) activates a relay to turn on the bathroom light. This operation is independent of the door status (open/closed). The occupancy indicator red LED (D3) is off at this point of time, indicating that the room is vacant. the door, keeping the light status unchanged. The high level point D (pin 8) is clocked in by IC1(a), turning on the occupancy indicator LED (D3) on at the time of closing of the door. When the person exits the bathroom, the door is opened again. Fig. 2.) The closing of the door by the door-closer produces a low-to-high transition at the clock input (pin 3) of IC1(a). This clocks in the low level at Q output of IC1(b) point D to Q output of IC1(a) point C, thereby turning off the occupancy indicator. 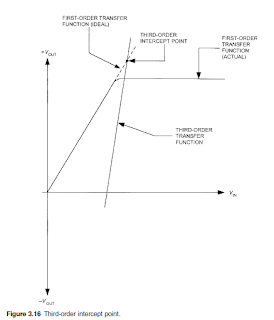 The term IFS in the above equations refers to meter’s fullscale deflection current rating in amperes. It must be noted that neither meter resistance nor diode voltage drops affects meter current. Note: The results obtained during practical testing of the circuit in EFY lab are tabulated in Tables I through IV. A high-input-resistance op-amp, a bridge rectifier, a microammeter, and a few other discrete components are all that are required to realise this versatile circuit. 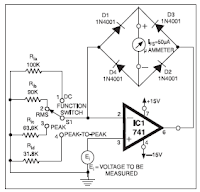 This circuit can be used for measurement of DC, AC RMS, AC peak, or AC peak-to-peak voltage by simply changing the value of the resistor connected between the inverting input terminal of the op-amp and ground. The voltage to be measured is connected to non-inverting input of the op-amp. WHAT ARE THE TYPES AND SPECIFICATIONS OF FREQUENCY SIGNAL FILTERS? • Bessel or maximally flat group delay filter. All of these filters have advantages and disadvantages and the one usually chosen is the filter type that suits the designer’s needs best. 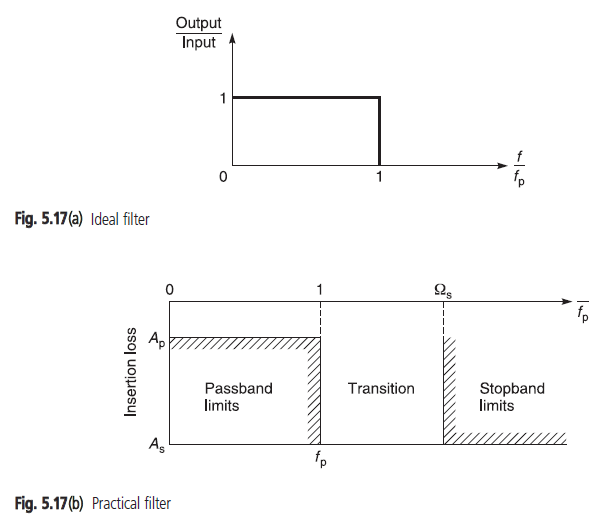 You should bear in mind that each of these filter types is also available in low pass, high pass, bandpass and stopband configurations. 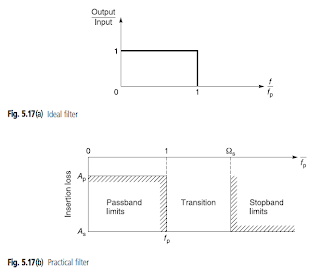 The important thing to bear in mind is that although the discussion on filters starts off by describing low pass filters, we will show you later by examples how easy it is to change a low pass filter into a high pass, a bandpass or a bandstop filter. Figure 5.17(a) shows the transmission characteristics of an ideal low pass filter on a normalised frequency scale, i.e. the frequency variable (f) has been divided by the passband line frequency ( fp). Such an ideal filter cannot, of course, be realised in practice. For a practical filter, tolerance limits have to be imposed and it may be represented pictorially as in Figure 5.17(b). The frequency spectrum is divided into three parts, first the passband in which the insertion loss (Ap) is to be less than a prescribed maximum loss up to a prescribed minimum frequency ( fp). The second part is the transition limit of the passband frequency limit fp and a frequency Ws in which the transition band attenuation must be greater than its design attenuation. The third part is the stopband limit in which the insertion loss or attenuation is to be greater than a prescribed minimum number of decibels. 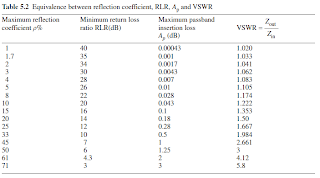 Sometimes, manufacturers prefer to specify passband loss in terms of return loss ratio (RLR) or reflection coefficient (r). We provide Table 5.2 to show you the relationship between these parameters. If the values that you require are not in the table, then use the set of formulae we have provided to calculate your own values. 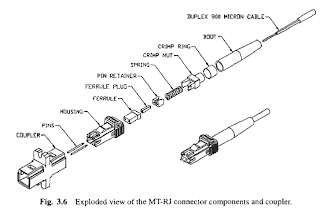 WHAT ARE MT - RJ CONNECTOR? 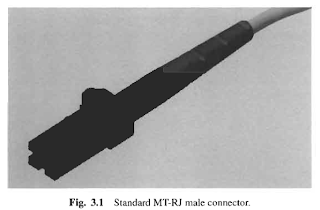 The MT-RT connector utilizes the same rectangular plastic ferrule technology as the MTP array-style connector first developed by NTT, with a single ferrule body housing two fibers at a 750-um pitch (Fig. 3.1). These ferrules are available in both single-mode and multimode tolerances, with the lowercost multimode version typically comprised of a glass-filled thermoplastic and the critically tolerance single-mode version comprised of a glass-filled thermoset material. Unlike the thermoplastic multimode ferrules, which can be manufactured using the standard injection mold process, the thermoset single-mode ferrules must be transfer molded, which is generally a slower but more accurate process. By design the alignment of two MT-RJ ferrules is achieved by mating a pair of metal guide pins with a corresponding pair of holes in the receptacle (Fig. 3.2). This feature makes the MT-RJ the only Small Form Factor connector with a distinct male and female connector. As a general rule, wall outlets, transceivers, and internal patch panel connectors will retain the guide pins (thus making their gender male) and the interconnecting jumpers will have no pins (female). In the event that two jumper assemblies require mating mid-span a special cable assembly with one male end and one female end must be used. However, some unique designs do allow for the insertion and extraction of guide pins in the field, affording the user the ability to change the connector’s gender as required. Latching of the MT-RJ connector is modeled after the copper RJ-45 connector, whereby a single latch arm positioned at the top of the connector housing is positively latched into the coupler or transceiver window. Although this latch design is similar in all the MT-RJ connector designs, individual latch pull strengths may vary depending on the connector material, arm deflection, and the relief angles built into the mating receptacles. For this reason it is recommended to evaluate connector pull strengths as a complete interface, depending on the specific manufacturer’s connector, coupler, or transceiver design, as the coupling performances may vary. 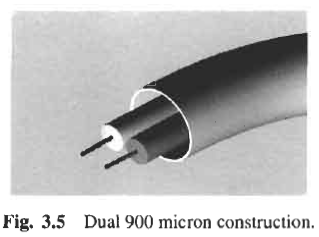 MT-RJ connectors are typically assembled on 2.8-mm round jacketed cable housing two optical fibers in one of three internal configurations. 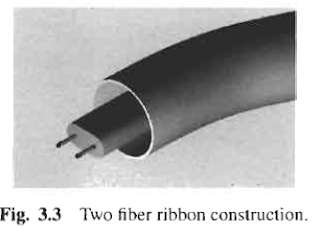 The first construction style consists of the two optical fibers encapsulated within a ribbon at a 750-um pitch (Fig. 3.3). This approach is unique to the MT-RJ connector and designed specifically to match the fiber spacing to the pitch of the ferrule for ease of fiber insertion. Although this construction style may be ideal for a MT-RJ termination, it can cause some difficulty when manufacturing a hybrid assembly, and availability may also be an issue based on its uniqueness. 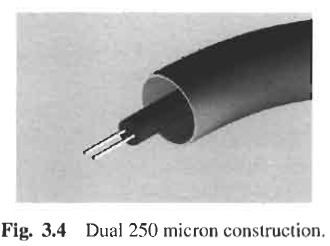 A second design which is more universal, utilizes a single 900-um buffer to house two 250-um fibers (Fig. 3.4). This construction is more conducive to hybrid cable manufacturing but the fibers will naturally maintain a 250-um pitch, thus making fiber insertion rather difficult. The third design is considered a standard construction and is used across the industry (Fig. 3.5). In this configuration each individual fiber is buffered with a PVC coating. The coating thickness is typically 900 um, but as in the previous case this does cause a mismatch of the fiber to ferrule pitch. To compensate for this, some connector designs incorporate a fiber transition boot, which gradually reduces the fiber pitch to 750 um, while others simply use a non-standard buffer coating of 750 um. In general the assembly and polish of the MT-RJ factory-style connector is considerably more difficult than the other small form factor connectors. 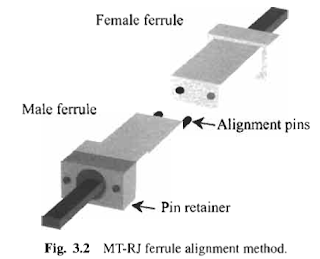 Typical MT-RJ designs have a minimum of eight individual components that must be assembled after the ferrule has been polished, allowing for a number of handling concerns (Fig. 3.6). As with the case of most MT-style ferrules, the perpendicularity or flatness of the ferrule endface with reference to the ferrule’s inner shoulder is critical and this cannot be accomplished if the connector is pre-assembled. Another unique requirement of the MT-RJ polish involves fiber protrusion. Although the ferrule endface is considered to be flat, depending on the polishing equipment, fixtures, and even contamination some angularity may occur. Therefore it is recommended that the fibers themselves protrude 1.2 to 3.0 ums from the ferrule surface in order to guarantee fiber-to-fiber contact. For the reasons previously mentioned, the factory-style MT-RJ connector is not a good candidate for field assembly and polishing, so a number of similar yet unique Field Installable Connectors have been developed. All of these field solutions utilize a pre-polished ferrule assembly, which is mated with two cleaved fibers and aligned by v-grooves, with the entire interface filled with index matching gel to compensate for any possible air gaps. One of the major differences between the various solutions is in the mechanism used to open and close the spring clip that maintains constant pressure on the two sandwiched halves of the channeled interface. In one design a cam, which is integrated into the connector body, is used to separate the halves while in other designs a separate hand tool is required. The other general difference between the field solutions is the application design - a number of the connectors are designed to be just that - a field connector with a distinct gender that can be terminated onto distribution style cable - while others are designed to be male receptacles only that must be wall or cabinet mounted. Because of the inherent difference between the MT-RJ fields solutions one solution may be better suited to a given application than another. WHAT ARE THE DIFFERENT DVD REGIONAL CODES? Motion picture studios want to control the home release of movies in different countries because cinema releases are not simultaneous worldwide. Movie studios have divided the world into six geographic regions. In this way, they can control the release of motion pictures and home videos into different countries at different times. A movie may be released onto the screens in Europe later than in the United States, thereby overlapping with the home video release in the U.S. Studios fear that copies of DVD discs from the U.S. would reach Europe and cut into theatrical sales. Also, studios sell distribution rights to different foreign distributors and would like to guarantee an exclusive market. Therefore, they have required that the DVD standard include codes that can be used to prevent playback of certain discs in certain geographical regions. Hence, DVD player is given a code for the region in which it is sold. It will not play discs that are not allowed in that region. Discs bought in one country may not play on players bought in another country. A further subdivision of regional codes occurs because of differing worldwide video standards. For example, Japan is region 2 but uses NTSC video compatible with that of North America (region 1). Europe is also region 2 but uses PAL, a video system not compatible with NTSC. Many European home video devices including DVD players are multi-standard and can reproduce both PAL and NTSC video signals. Regional codes are entirely optional for the maker of a disc (the studio) or distributor. The code division is based on nine regions, or “locales.” The discs are identified by the region number superimposed on a world globe. If a disc plays in more than one region it will have more than one number on the globe. Discs without codes will play on any player in any country in the world. In hindsight, the attempt at regional segregation was probably doomed to failure from the start. Some of the region standards proved more complicated to finalize than was originally expected. There were huge variations in censorship laws and in the number of different languages spoken across a region. This was one of the reasons why DVD took so long to become established. For example, it is impossible to include films coded for every country in Region-2 on a single disc. This led the DVD forum to split the region into several sub-regions. And this, in turn, caused delays in the availability of Region-2 discs. By the autumn of 1998 barely a dozen Region-2 discs had been released compared to the hundreds of titles available in the U.S. This situation led to many companies selling DVD players that had been reconfigured to play discs from any region. For several years now games console manufacturers (Nintendo, Sega and Sony) have been trying to stop owners from playing games imported from other countries. Generally, whenever such regional standards were implemented it took someone only a few weeks to find a way around it, either through a machine modification or use of a cartridge adapter. In real terms, regional DVD coding has cost the DVD Forum a lot of money, delayed market up-take, and allowed third-party companies to make a great deal of money bypassing it. WHAT ARE THE DIFFERENT DVD FORMAT TYPES? The three application formats of DVD include DVD-Video, DVD-Audio, and DVD-ROM. The DVD-Video format (commonly called “DVD”) is by far the most widely known. DVDVideo is principally a video and audio format used for movies, music concert videos, and other video-based programming. It was developed with significant input from Hollywood studios and is intended to be a long-term replacement for the VHS videocassette as a means for delivering films into the home. DVD-Video discs are played in a machine that looks like a CD player connected to a TV set. This format first emerged in the spring of 1997 and is now considered mainstream, having passed the 10% milestone adoption rate in North America by late 2000. The DVD-Audio format features high-resolution, two-channel stereo and multi-channel (up to six discrete channels) audio. The format made its debut in the summer of 2000 after copy protection issues were resolved. DVD-Audio titles are still very few in number and have not reached mainstream status, even though DVD-Audio and DVD-Video players are widely available. This is due primarily to the existence of several competing audio formats in the market. DVD-ROM is a data storage format developed with significant input from the computer industry. It may be viewed as a fast, large-capacity CD-ROM. It is played back in a computer’s DVD-ROM drive. It allows for data archival and mass storage as well as interactive and/or web-based content. DVD-ROM is a superset of DVD-Video. If implemented according to the specifications, DVD-Video discs will play with all the features in a DVD ROM drive, but DVD-ROM discs will not play in a DVD-Video player. (No harm will occur. The discs will either not play, or will only play the video portions of the DVD-ROM disc.) The DVD-ROM specification includes recordable versions - either one time (DVD-R), or many times (DVD-RAM). Few DVD-ROM titles are available and most of those are simply CD-ROM titles that previously required multiple discs (e.g., telephone books, encyclopedias, large games). A DVD disc may contain any combination of DVD-Video, DVD-Audio, and/or DVD-ROM applications. For example, some DVD movie titles contain DVD-ROM content portion on the same disc as the movie. This DVD-ROM content provides additional interactive and web-based content that can be accessed when using a computer with a DVD-ROM drive. And some DVD-Audio titles are actually DVD-Audio/Video discs that have additional DVD-Video content. This content can provide video-based bonus programming such as artist interviews, music videos, or a Dolby Digital and/or DTS surround soundtrack. The soundtrack can be played back by any DVD Video player in conjunction with a 5.1-channel surround sound home theater system. ■ DVD-R – DVD-R can record data once, and only in sequential order. It is compatible with all DVD drives and players. The capacity is 4.7 GB. ■ DVD-RW – The rewritable/erasable version of DVD-R. It is compatible with all DVD drives and players. ■ DVD+R and DVD+RW – The rewritable/erasable version of DVD+R. ■ DVD-RAM – Rewritable/erasable by definition. The last three erasable (or rewritable) DVD formats—DVD-RW, DVD-RAM, and DVD+RW—are slightly different. Their differences have created mutual incompatibility issues and have led to competition among the standards. That is, one recordable format cannot be used interchangeably with the other two recordable formats. And one of these recordable formats is not even compatible with most of the 17 million existing DVD-Video players. This three-way format war is similar to the VHS vs. Betamax videocassette format war of the early 1980s. This incompatibility along with the high cost of owning a DVD recordable drive has limited the success of the DVD recordable market. WHAT IS IF NOTCH REJECTION? If two signals fall within the passband of a receiver they will both compete to be heard. They will also heterodyne together in the detector stage, producing an audio tone equal to their carrier frequency difference. For example, suppose we have an AM receiver with a 5 kHz bandwidth and a 455 kHz IF. If two signals appear on the band such that one appears at an IF of 456 kHz and the other is at 454 kHz, then both are within the receiver passband and both will be heard in the output. However, the 2 kHz difference in their carrier frequency will produce a 2 kHz heterodyne audio tone difference signal in the output of the AM detector. 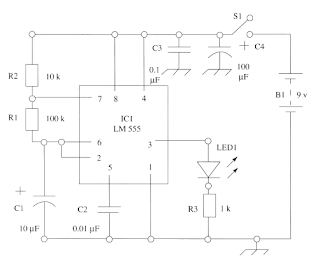 In some receivers, a tunable high-Q (narrow and deep) notch filter is in the IF amplifier circuit. This tunable filter can be turned on and then adjusted to attenuate the unwanted interfering signal, reducing the irritating heterodyne. 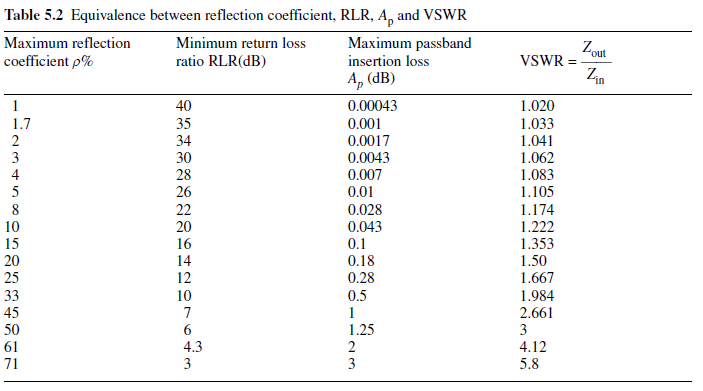 Attenuation figures for good receivers vary from –35 to –65 dB or so (the more negative the better). There are some trade-offs in notch filter design. First, the notch filter Q is more easily achieved at low IF frequencies (such as 50 kHz to 500 kHz) than at high IF frequencies (e.g. 9 MHz and up). Also, the higher the Q the better the attenuation of the undesired squeal, but the touchier it is to tune. Some happy middle ground between the irritating squeal and the touchy tune is mandated here. Some receivers use audio filters rather than IF filters to help reduce the heterodyne squeal. In the AM broadcast band, channel spacing is 9 or 10 kHz (depending on the part of the world), and the transmitted audio bandwidth is 5 kHz. Designers of AM broadcast receivers may insert an R–C low-pass filter with a –3 dB point just above 4 or 5 kHz right after the detector in order to suppress the audio heterodyne. This R–C filter is called a ‘tweet filter’ in the slang of the electronic service/repair trade. Another audio approach is to sharply limit the bandpass of the audio amplifiers. Although the shortwave bands typically only need 3 kHz bandwidth for communications, and 5 kHz for broadcast, the tweet filter and audio roll-off might not be sufficient. In receivers that lack an effective IF notch filter, an audio notch filter can be provided. WHAT ARE -1dB COMPRESSION POINT AND THIRD ORDER INTERCEPT POINT? 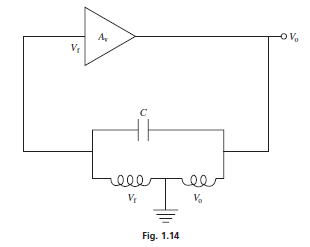 An amplifier produces an output signal that has a higher amplitude than the input signal. The transfer function of the amplifier (indeed, any circuit with output and input) is the ratio OUT/IN, so for the power amplification of a receiver RF amplifier it is Po/Pin (or, in terms of voltage, Vo/Vin). 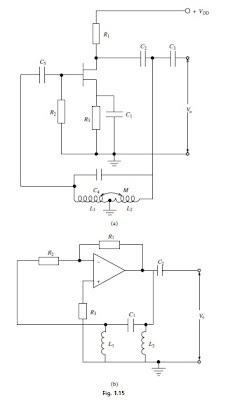 Any real amplifier will saturate given a strong enough input signal (see Fig. 3.16). The dotted line represents the theoretical output level for all values of input signal (the slope of the line represents the gain of the amplifier). As the amplifier saturates (solid line), however, the actual gain begins to depart from the theoretical at some level of input signal. The –1 dB compression point is that output level at which the actual gain departs from the theoretical gain by –1 dB. The –1 dB compression point is important when considering either the RF amplifier ahead of the mixer (if any), or any outboard preamplifiers that are used. The –1dB compression point is the point at which signal distortion becomes a serious problem. Harmonics and intermodulation are generated at high levels when an amplifier goes into compression. It can be claimed that the third-order intercept point (TOIP) is the single most important specification of a receiver’s dynamic performance because it predicts the performance as regards intermodulation, cross-modulation and blocking desensitization. Third-order (and higher) intermodulation products (IP) are normally very weak, and don’t exceed the receiver noise floor when the receiver is operating in the linear region. As input signal levels increase, forcing the front-end of the receiver toward the saturated nonlinear region, the IP emerge from the noise and begin to cause problems. When this happens, new spurious signals appear on the band and self-generated interference begins to arise. Look again at Fig. 3.16. The dotted gain line continuing above the saturation region shows the theoretical output that would be produced if the gain did not clip. It is the nature of third-order products in the output signal to emerge from the noise at a certain input level, and increase as the cube of the input level. Thus, the third-order line increases 3 dB for every 1 dB increase in the response to the fundamental signal. Although the output response of the third-order line saturates similarly to that of the fundamental signal, the gain line can be continued to a point where it intersects the gain line of the fundamental signal. This point is the third-order intercept point (TOIP). Interestingly, one receiver feature that can help reduce IP levels is the use of a front-end attenuator (or input attenuator). In the presence of strong signals even a few dB of input attenuation is often enough to drop the IPs back into the noise, while afflicting the desired signals only a small amount. Other effects that reduce the overload caused by a strong signal also help. Situations arise where the apparent third-order performance of a receiver improves dramatically when a lower gain antenna is used. This effect can be easily demonstrated using a spectrum analyser for the receiver. This instrument is a swept frequency receiver that displays an output on an oscilloscope screen that is amplitude-vs-frequency, so a single signal shows as a spike. In one test, a local VHF band repeater came on the air every few seconds, and one could observe the second- and third-order IPs along with the fundamental repeater signal. There were also other strong signals on the air, but just outside the band. Inserting a 6 dB barrel attenuator in the input line eliminated the IP products, showing just the actual signals. Rotating a directional antenna away from the direction of the interfering signal will also accomplish this effect in many cases. Preamplifiers are popular receiver accessories, but can often reduce rather than enhance performance. Two problems commonly occur (assuming the preamp is a low noise device). The best known problem is that the preamp amplifies noise as much as signals, and while it makes the signal louder it also makes the noise louder by the same amount. Since it’s the signal-to-noise ratio that is important, this does not improve the situation. Indeed, if the preamp is itself noisy, it will deteriorate the SNR. The other problem is less well known, but potentially more devastating. If the increased signal levels applied to the receiver push the receiver into non-linearity, then IPs will emerge. When evaluating receivers, a TOIP of +5 to +20 dBm is excellent performance, while up to +27 dBm is relatively easily achievable, and +35 dBm has been achieved with good design; anything greater than +50 dBm is close to miraculous (but attainable). Receivers are still regarded as good performers in the 0 to +5 dBm range, and middling performers in the –10 to 0 dBm range. Anything below –10 dBm is not usually acceptable. A general rule is to buy the best third-order intercept performance that you can afford, especially if there are strong signal sources in your vicinity. Understanding the dynamic performance of the receiver requires knowledge of intermodulation products (IP) and how they affect receiver operation. Whenever two signals at frequencies F1 and F2 are mixed together in a non-linear circuit, a number of products are created according to the mF1 ± nF2 rule, where m and n are either integers or zero (0, 1, 2, 3, 4, 5, . . .). Mixing can occur in either the mixer stage of a receiver front end, or in the RF amplifier (or any outboard preamplifiers used ahead of the receiver) if the RF amplifier is overdriven by a strong signal. It is also possible for corrosion on antenna connections, or even rusted antenna screw terminals to create IPs under certain circumstances. When an amplifier or receiver is overdriven, the second-order content of the output signal increases as the square of the input signal level, while the third-order responses increase as the cube of the input signal level. Consider the case where two HF signals, F1 = 10 MHz and F2 = 15 MHz are mixed together. The second order IPs are 5 and 25 MHz; the third-order IPs are 5, 20, 35 and 40 MHz; and the fifth-order IPs are 0, 25, 60 and 65 MHz. If any of these are inside the passband of the receiver, then they can cause problems. One such problem is the emergence of ‘phantom’ signals at the IP frequencies. This effect is seen often when two strong signals (F1 and F2) exist and can affect the front-end of the receiver, and one of the IPs falls close to a desired signal frequency, Fd. Note that one third-order product is on the same frequency as the desired signal, and could easily cause interference if the amplitude is sufficiently high. Other third- and fifth order products may be within the range where interference could occur, especially on receivers with wide bandwidths. The IP orders are theoretically infinite because there are no bounds on either m or n. However, because the higher order IPs have smaller amplitudes only the second-order, third-order and fifth-order products usually assume any importance. Indeed, only the third-order is normally used in receiver specification sheets because they fall close to the RF signal frequency. There are a large number of IMD products from just two signals applied to a non-linear medium. But consider the fact that the two-tone case used for textbook discussions is rarely encountered in actuality. A typical two-way radio installation is in a signal rich environment, so when dozens of signals are present the number of possible combinations climbs to an unmanageable extent. 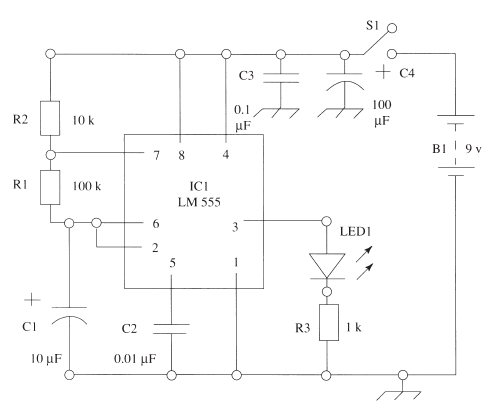 This circuit, when completed, causes a light-emitting diode (LED) to flash or pulse alternately on and off at a very slow rate, that is, at a low frequency. It could be used as a dummy car alarm indicator. You sometimes see these tiny pulsating lights in expensive cars protected by sophisticated car security systems, warning you that the car alarm is armed and ready. For this design, the LED flashes on for a brief period and stays off for a relatively longer period. Because additional current is consumed from the battery every time the LED comes on, this long rest period conserves battery power. The brightness of the indicator LED is also limited, again in order to preserve battery power. The 555 timer integrated circuit (IC) is configured in an oscillating mode that results in a continuous train of pulses being generated. 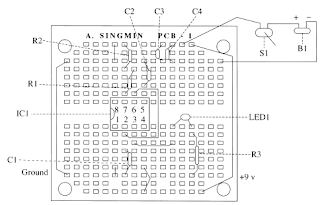 The frequency determining components have been chosen to give a very slow pulse rate.Two resistors and a capacitor determine the flashing rate of the LED. Power is supplied from a 9-volt battery. connection is the same as the negative battery terminal. conserves power but results in a dimmer light output. This pin always goes to the positive supply voltage. This pin is generally taken to ground via a capacitor, C2 (0.01mF). 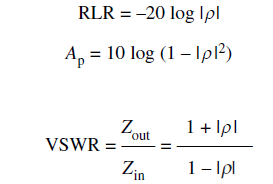 to the positive supply voltage via a second resistor, R2 (10kohm). various connections on the figure. Start with pin #1 and work up to pin #8. How do you know which end of the color bands to start reading from? that a distinguishing line of minus signs is marked on one edge of the capacitor. capacitor is actually marked on the body—10mF. capacitor is not polarity sensitive and can be inserted either way. Capacitor C3 (0.1mF) is a disc ceramic type with a coded value of 104¢. to ground for the circuit projects described herein. etched onto the package identifies pin #1.The pins are arranged four per side. and lead to no end of problems. goes to the red voltmeter lead. electrical schematic in Figure 17-1.
terminal.Within a few seconds, the solder will melt. if you are a beginner to soldering. cause a short-circuit. Do not insert the IC at this stage. position of the links, which are all marked for clarity. Start with LED1 and resistor R3 (1kohm). Look closely at the LED. Do not solder in the extended LED to the SINGMIN PCB at this stage. solder. Once cooled, the leads can be trimmed to length. check and trim the leads. positive supply voltage. All of the resistor connections are now completed. goes to pin #2, and the negative end goes to ground. way because it is not polarity sensitive. ground.The negative end of C4 goes to ground. That completes all of the electronic component connections. Perform a thorough check of all of the connections. socket. Make sure all of the pins go in straight and smoothly. poor solder joints, and short-circuits are the most common causes of problems. Component failure is rarely, if ever, to blame. Here’s the circuit of a multi-switch input musical doorbell (shown in Fig.1). 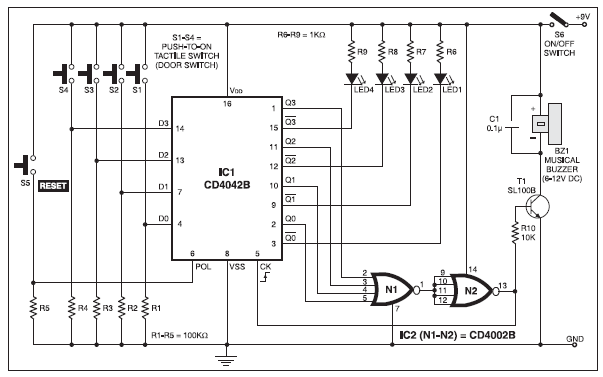 The circuit is built around the popular and less expensive quad D-latch CD4042B (IC1). When switch S6 is pushed to ‘on’ condition, the circuit gets +9V and the four data inputs (D1 through D4) of ICI are in low state because these are tied to ground via resistors R1 through R4. Polarity input (POL) pin 6 of IC1 is also pulled down by resistor R5. Clock input (pin 5) of the quad D-latch is wired in normally low mode and hence all the four outputs (Q0 through Q3) have the same states as their corresponding data inputs. As a result, LED1 through LED4 are in off condition. There are four switches fitted at four different doors/gates outside the home and a monitoring panel (as shown in Fig. 2) in the common room of the home. If any switch is pressed by a visitor (for example switch S1 at door 1), pins 2 and 4 of IC1 go high. Simultaneously, pin 3 to IC1 (Q0 output) goes low and LED1 starts glowing to indicate that switch S1 is pressed by someone. Next, output pin 13 of the dual 4-input NOR gate (IC2, here wired as a single 4-input OR gate) goes high to forward bias buzzerdriver transistor T1 via resistor R10. The final result is a soft and pleasing musical bell, which lasts until reset switch S5 is pressedby the owner. For this latching arrangement, output pin 13 of IC2 from the NOR gate is fed back tothe clock input of IC1. The circuit costs around Rs 100. It is often very convenient for other people in the room to listen to both sides of a phone conversation. The amplifier in this it has been designed for this use. A specially designed magnetic pickup with a suction cup attaches onto the earpiece of your phone at one end and into the amplifier at the other. The design is low cost and there is no direct electrical connection to the phone system. The kit is constructed on single-sided printed circuit boards. Protel Autotrax & Schematic were used. Check off the components against the component listing. Make sure you identify every component. It is generally easiest if you solder the lowest height components first, the resistors then the capacitors & IC sockets. Make sure to get the electrolytic capacitors around the correct way. Note there is one link to make on the board next to the power supply pads. Use an offcut from a resistor to make the link. The telephone pickup is really a magnetic field fluctuation detector. It picks up the oscillating magnetic field from the receiver of your telephone when someone is speaking to you. But it will also collect any other oscillating magnetic fields which happen to be floating around in the air. For example, low & high frequency noise from your TV set or computer monitor or the characteristic mains humm from power lines. High frequency filters have been built into the circuit to reduce some of this unwanted noise. The telephone pickup circuit consists of two high gain preamplifier stages in the LM358 followed by a The\ output of the second preamp is fed to the power amplifier stage via C7 & P1. C7 removes any DC component from the amplified signal while P1 acts as a volume control. The LM386 is very easy to use and requires a minimum of external components. C8 provides filternig & bypassing for the internal bias network. C9 removes any DC component from the output signal. The gain of the LM386 may be set according to the combination of resistors & capacitors across pins 1 & 8. With no components the gain is 20. Finally use some wire to connect the speaker to the terminal block output. Place the suction cup near the receiver on the handset. Keep the speaker away from the handset to stop any feedback. The pickup will be affected by strong magnetic fields - mains wiring, a computer monitor and TV set. Low roll-off filters (to reduce the 50Hz hum) could have been included in the circuit just as the high roll-off filters have been. However, since the pickup responds to low frequency this allows the unit to be used to trace mains wiring behind your walls or under the floor. Poor soldering is the most likely reason. Check all solder joints carefully under a good light. Next check that all components are in their correct position on the PCB. Did you add the single link. Are the IC's in their correct places. Are the electrolytic capacitors around the correct way.power amplifier to drive the speaker. The IC's are low cost and easily available. Both preamps in the LM358 are biased to half the supply voltage by R4 & R5. This allows maximum voltage swing at the outputs before hitting either supply rail. 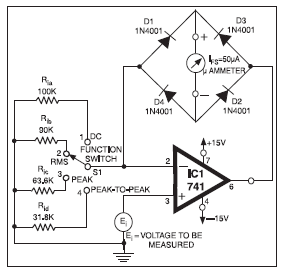 C6 bypasses any AC signal to ground, stabalizing the DC bias voltage. R3 is necessary to couple the DC bias voltage to IC1:B while also providing a high impedence to the input signal. This gives a cutoff frequency of 2.7KHz which has the effect of limiting the amount of high frequency noise, or 'hiss'. This high frequency roll-off does not greatly affect voice frequency signals since voice frequency is nominally in the range 300Hz to 3.0KHz. This oscillator is very similar to the Colpitts except that it has a split inductance. It is represented in a similar way to the Colpitts, as seen in Fig. 1.14. It may be designed using a similar approach to the Colpitts but it has the disadvantages of mutual inductance between the coils, which causes unpredictable frequencies, and also the inductance is more difficult to vary. When two coils are placed in close proximity to one another the flux due to the magnetic field of one interacts with the other. Hence an induced voltage is applied to the second coil due to the rate of change of flux. Similarly, flux due to the magnetic field of the second coil may cut the first coil, also inducing a voltage in it. This is referred to as mutual induction, in contrast to self-inductance which is caused by lines of magnetic force cutting a single coil. Hence the rate of change of flux in one coil affects the other. Splitting a single coil causes similar effects and mutual inductance exists between the two parts. As can be seen from equations (1.14), (1.15) and (1.16), the gain and frequency are dependent on the mutual inductance, and these parameters may be difficult to achieve as the tapping point has to be precise. The remarks made earlier concerning loading and Q factors also apply here. While the Hartley and Colpitts oscillators have a similar design, the Hartley is easier to tune while the Colpitts requires two ganged capacitors. An advantage of using a Colpitts oscillator is the reduction in low-capacitance paths which can cause spurious oscillations at high frequencies. This is mainly due to the inter-electrode capacitance of the semiconductors. The Hartley oscillator, on the other hand, can produce several LC combinations due to the capacitance between the turns of the coil and thus cause spurious oscillations. 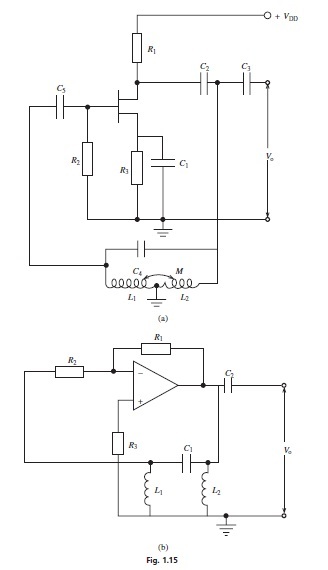 It is for this reason that the Colpitts oscillator is often used as the local oscillator in receivers. When you desolder a through-hole component, one unfortunate result of failing to get the hole hot enough is that its copper lining comes out with the lead. If you see what looks like a sleeve around the lead, you’ve torn out the copper. On a double-sided board, it’s not a catastrophe. When you replace the part, be sure to solder both the top and bottom contact points, and all will be well. You might have to scrape some of the green solder mask coating off the top area to get contact between the lead and the foil. That’s best done with the tip of an X-Acto knife. Pulling the sleeve out of a multilayer board can destroy it because you have no way to reconnect with interior foil layers that were in contact with the sleeve. If you’re lucky, that particular hole might not have had inner contacts, and soldering to the top and bottom may save the day, so it’s worth a try. Don’t be surprised, though, if the circuit no longer works. a broken trace went, verify continuity with your DMM, from the end back to the break. Don’t forget to scrape off the solder mask where you want to contact the broken line. Wire jumping can help save boards with bad conductive glue interconnects, too. On a double-sided board, you can scrape out the glue and run a strand of bare wire through the hole, soldering it to either side. Forget about trying this on a multilayer board, however; you’ll probably trash it while trying to clean the hole. On those, it’s best to run an insulated wire around the board from one side to the other. That adds extra length to the conductive path, which could cause problems in some critical circuits, especially those operating at high frequencies. At audio frequencies, it should be fine. If some interior layers are no longer making contact with the glue, this won’t work. Most conductive glue boards I’ve seen have been double-sided, making them suitable for wire jumping. If the board is cracked from, say, having taken a fall, scrape the ends of the copper lines at the crack. It’s possible to simply solder over them, bridging the crack, but that technique tends to be less permanent than placing very fine wire over the break and soldering on either side. To get wire fine enough, look through your stash of parts machines for some small-gauge stranded wire. Skin it, untwist it and remove a single strand. Sometimes there are multiple broken lines too close to each other for soldering without creating shorts between them. To save boards like that, scrape the solder mask off close to the crack on every other line. Then scrape the in-between lines farther away from the crack. Use the bare wire strands to fix the close set, and use wire-wrap wire (very thin, single-strand, insulated wire used with wire-wrap guns for prototyping experimental circuitry) or enamel-insulated “magnet wire” to jump the farther set. Wire-wrap wire is especially good for this kind of work because its insulation doesn’t melt very easily, so it won’t crawl up the wire when you solder close to it, exposing bare wire that could short to the repaired lines nearby. Plus, it’s thin enough to fit in pretty small spaces. For even tighter environments, use the magnet wire. Just be sure to tin the ends of the wire to remove the enamel, so you’ll get a good connection. It’s possible to repair broken ribbon cables in stationary applications (the ribbon doesn’t move or flex), if they are the copper-conductor type of ribbons, not the very thin, printed style. Fixing cracks with wire is a tedious, time-consuming technique, but it works. Accomplishing it without causing shorts takes practice and isn’t always possible with very small, dense boards and ribbons. On multilayer boards, cracks and torn sleeves are extremely difficult to bypass. If you have a schematic, you may be able to find the path and jump with wire. Without one, it’s pretty much impossible when the tracks are inside the board. In 1880, only four years after his invention of the telephone, Alexander Graham Bell used light for the transmission of speech. He called his device a Photophone. It was a tube with a flexible mirror at its end. He spoke down the tube and the sound vibrated the mirror. The modulated light was detected by a photocell placed at a distance of two hundred meters or so. The result was certainly not hi-fi but the speech could at least be understood. Following the invention of the ruby laser in 1960, the direct use of light for communication was re-investigated. However the data links still suffered from the need for an unobstructed path between the sender and the receiver. Nevertheless, it was an interesting idea and in 1983 it was used to send a message, by Morse code, over a distance of 240 km (150 miles) between two mountain tops. Enormous resources were poured into the search for a material with sufficient clarity to allow the development of an optic fiber to carry the light over long distances. The early results were disappointing. The losses were such that the light power was halved every three meters along the route. This would reduce the power by a factor of a million over only 60 meters (200 feet). Obviously this would rule out long distance communications even when using a powerful laser. Within ten years however, we were using a silica glass with losses comparable with the best copper cables. The glass used for optic fiber is unbelievably clear. We are used to normal ‘window’ glass looking clear but it is not even on the same planet when compared with the new silica glass. We could construct a pane of glass several kilometers thick and still match the clarity of a normal window. If water were this clear we would be able to see the bottom of the deepest parts of the ocean. We occasionally use plastic for optic fiber but its losses are still impossibly high for long distance communications but for short links of a few tens of meters it is satisfactory and simple to use. It is finding increasing applications in hi-fi systems, and in automobile control circuitry. On the other hand, a fiber optic system using a glass fiber is certainly capable of carrying light over long distances. By converting an input signal into short flashes of light, the optic fiber is able to carry complex information over distances of more than a hundred kilometers without additional amplification. This is at least five times better than the distances attainable using the best copper coaxial cables. The system is basically very simple: a signal is used to vary, or modulate, the light output of a suitable source — usually a laser or an LED (light emitting diode). The flashes of light travel along the fiber and, at the far end, are converted to an electrical signal by means of a photo electric cell. Thus the original input signal is recovered. When telephones were first invented, it took 75 years before we reached a global figure of 50 million subscribers. Television took only 13 years to achieve the same penetration and the Internet passed both in only four years. As all three of these use fiber optics it is therefore not surprising that cables are being laid as fast as possible across all continents and oceans. Optic fibers carry most of the half million international telephone calls leaving the US everyday and in the UK over 95% of all telephone traffic is carried by fiber. Worldwide, fiber carries 85% of all communications. There are four major propagation paths: surface wave, space wave, tropospheric, and ionospheric. 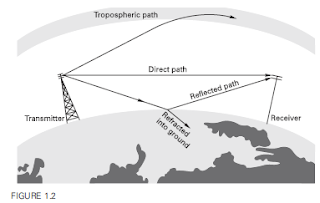 The ionospheric path is important to medium-wave and HF propagation, but is not important to VHF, UHF, or microwave propagation. The space wave and surface wave are both ground waves, but behave differently. The surface wave travels in direct contact with the Earth’s surface, and it suffers a severe frequency dependent attenuation due to absorption into the ground. The space wave is also a ground wave phenomenon, but is radiated from an antenna many wavelengths above the surface. No part of the space wave normally travels in contact with the surface; VHF, UHF, and microwave signals are usually space waves. There are, however, two components of the space wave in many cases: direct and reflected (Figure 1.2). The ionosphere is the region of the Earth’s atmosphere that is between the stratosphere and outer space. The peculiar feature of the ionosphere is that molecules of atmospheric gases (O2 and N2) can be ionized by stripping away electrons under the influence of solar radiation and certain other sources of energy (see Figure 1.1). In the ionosphere the air density is so low that positive ions can travel relatively long distances before recombining with electrons to form electrically neutral atoms. As a result, the ionosphere remains ionized for long periods of the day – even after sunset. At lower altitudes, however, air density is greater, and recombination thus occurs rapidly. 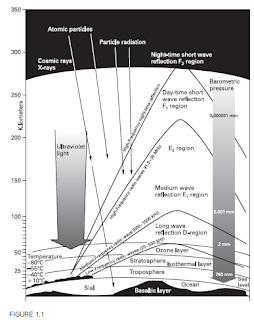 At those altitudes, solar ionization diminishes to nearly zero immediately after sunset or never achieves any significant levels even at local noon. Ionization and recombination phenomena in the ionosphere add to the noise level experienced at VHF, UHF, and microwave frequencies. The properties of the ionosphere are therefore important at these frequencies because of the noise contribution. In addition, in satellite communications there are some transionospheric effects.